“The masses will enter the city centre” said the sign above the gate leading into Muranów, in front of which new residents received keys to their new apartments granted by the authorities. Not only was Muranów supposed to be a settlement-monument to commemorate the Warsaw Ghetto, as its architect wanted, but also the first and the biggest housing estate for the working class in Warsaw’s city centre. Its architectural aim was to contrast the pre-war densely populated streets of the Northern District. 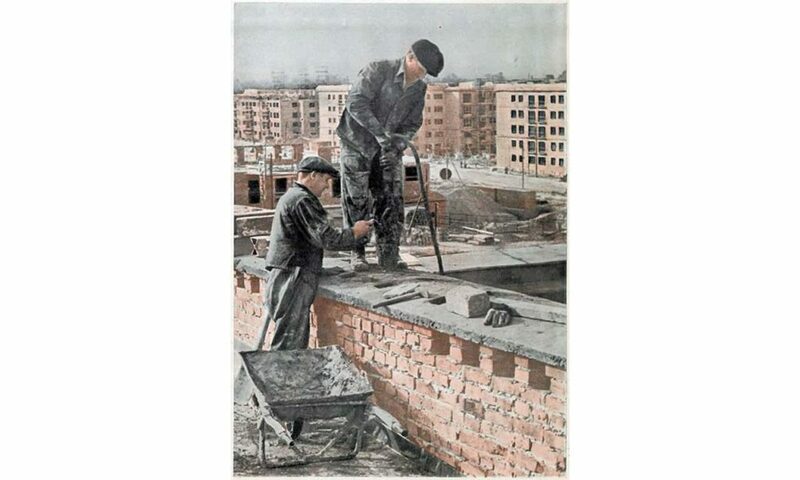 During the walk, we will tell you about the rivalry of work and competition between Muranów and another massive social-realist construction site of the time in Poland, i.e. Nowa Huta in Krakow. We’ll find out who was breaking records in productivity and who won the “rationalization races”. We will learn about the heroes from propaganda literature, namely construction workers and engineers, we will analyse the mythology behind the “hero-worker” and socialist women workers, take a close look at the first residents, and go back to the pioneer times of Muranów captured in literature and film.